Odell Cornelious Beckham Jr. (born November 5, 1992) is an American football wide receiver for the New York Giants of the National Football League (NFL). He played college football at Louisiana State University (LSU), and was drafted by the Giants in the first round of the 2014 NFL Draft with the 12th pick. Beckham was born in Baton Rouge, Louisiana. He attended Isidore Newman School in New Orleans, Louisiana, where he was a letterman in football, basketball and track. In football, he played wide receiver, quarterback, running back, and cornerback. As a junior, he caught 45 passes for 743 yards and 10 touchdowns, while also adding three more scores on the ground. As a senior, he hauled in 50 catches for 1,010 yards and 19 touchdowns, joining Cooper Manning as the only two players in school history to record 1,000 receiving yards in a season. In addition, he rushed for 331 yards and six touchdowns, passed for 90 yards and a score and also averaged 30.0 yards per punt return. He was named to the Times Picayune 2011 Blue-Chip list and to the Louisiana 2A All-State first team as a wide receiver, while he also earned District 9-2A Offensive MVP honors and a spot on The Advocate’s Super Dozen. In addition to football, Beckham participated in basketball, track and soccer. In basketball, Beckham lettered all four years and was an all-district selection his junior and senior years. Also a standout track & field athlete, Beckham followed in his mother's footsteps to excel in the sprinting and jumping events while at Newman High. He took silver in the long jump event at the 2010 Newman Invitational, with a career-best leap of 6.83 meters. At the 2010 LA 2A State Meet, he earned sixth-place finishes in both the 200-meter dash, with a PR time of 22.31 seconds, and in the long jump, with a leap of 6.71 meters (21 ft 11 in). He was also a member of the Newman 4 × 100 m and 4 × 200 m relay teams. Beckham played soccer and considers English soccer player David Beckham his childhood idol. His youth coach wanted him to try out for a national junior team, but Beckham did not want to spend the required time overseas considering his talents in other sports at home. Regarded as a four-star recruit by both Rivals.com and Scout.com, Beckham was rated as the No. 6 wide receiver and as the No. 40 player in the nation. He chose Louisiana State University (LSU) over scholarship offers from Ole Miss, Nebraska, Tulane and Tulsa, among others. He also played in the 2011 U.S. Army All-American Bowl. As a true freshman at LSU in 2011, Beckham started nine of 14 games, recording 41 receptions for 475 yards and two touchdowns. He was named a freshman All-SEC selection. As a sophomore in 2012, he started 12 of 13 games. He finished first on the team in receiving yards with 713 and second in receptions with 43. As a junior in 2013, he combined with Jarvis Landry to form one of the best wide receiver duos in college football. In the 2013 game against UAB, Beckham returned a failed field goal attempt for a record-long 109 yards and a touchdown (this record would be tied by Auburn's Chris Davis later that year). He was a first and second-team All-Southeastern Conference (SEC) selection. In his role as a wide receiver and return specialist, Beckham was named the winner of the 2013 Paul Hornung Award, presented annually to the most versatile player in major college football. He finished the season with 57 receptions for 1,117 yards and eight touchdowns. After the season he entered the 2014 NFL Draft, where he was selected twelfth overall by the New York Giants. Beckham was selected by the New York Giants with the 12th overall pick in the first round of the 2014 NFL Draft. Beckham signed a contract with the Giants on May 19, 2014. After missing a majority of the training camp, preseason, and the first four games of the season because of a hamstring injury, Beckham made his debut on October 5, 2014, against the Atlanta Falcons recording four receptions for 44 yards and a touchdown. In his first Monday Night Football game against the Indianapolis Colts, Beckham caught 8 passes for 156 yards. Against the Seattle Seahawks in Week 10, he caught 7 passes for 108 yards. On November 23, 2014, during a game against the Dallas Cowboys on Sunday Night Football, Beckham had 10 catches for 146 yards and two touchdowns, including a one-handed touchdown reception hailed as the "catch of the year", with Cris Collinsworth, Tony Dungy, Victor Cruz and even NBA superstar LeBron James all saying that it was one of the best catches ever. Beckham made this catch despite a pass interference penalty called on Dallas's Brandon Carr while diving backwards with full extension of his right hand using only three fingers. The Giants still lost due to a touchdown throw from Tony Romo to Dez Bryant. On December 8, 2014 the Pro Football Hall of Fame put Beckham's game-worn jersey from his famous one-handed catch game vs. Dallas on display. Beckham finished November with 38 receptions, 593 receiving yards and 2 touchdowns. He had at least 90 yards receiving in all five games in November, setting an NFL rookie record for a calendar month. He also broke Bill Groman's and Randy Moss' rookie record for consecutive games with 90 or more receiving yards in a season. In week 14, Beckham extended his 90 receiving yard streak to 6 games, recording 11 receptions for 131 yards and a touchdown vs. Tennessee Titans. He also joined Bill Groman as the only rookies to have over 700 receiving yards in a six-game span. On December 14, 2014, Beckham became the first NFL rookie with at least 12 catches, 140 yards and three scores in a game racking up 143 receiving yards, 12 catches and three touchdowns. With his 12 receptions, Beckham tied former Giants tight end Mark Bavaro for the most in a game by a Giants rookie; Bavaro had 12 catches against the Cincinnati Bengals on Oct. 13, 1985. Beckham Jr’s 143 receiving yards marked the fifth time he topped 100 receiving yards during the 2014 season, extending his own Giants record and setting an NFL rookie record of over 90 receiving yards in seven straight games. With 61 catches over seven games, Beckham also set the record for most ever receptions by an NFL rookie in a seven-game span. On December 21, 2014, Beckham extended his streak of 90 or more receiving yards in game to 8 when he racked up 148 receiving yards on 8 receptions and also hauled in 2 touchdowns vs. St. Louis Rams, including an 80-yard score, the longest touchdown reception by a Giants rookie in franchise history. He also extended his streak of games with 130+ receiving yards and at least one receiving touchdown to three. In the regular season finale against the Philadelphia Eagles, Beckham had a career high 185 receiving yards, which was the most in a game by a rookie in franchise history. Mark Bavaro previously held the record when he had 176 receiving yards vs. Bengals on Oct. 13, 1985. Beckham also had 12 receptions and a receiving touchdown vs. Eagles, which tied Torry Holt for most games with 10+ receptions, 100+ receiving yards & 1+ receiving touchdown in a season with four. Beckham finished his impressive rookie campaign with 91 receptions, 1,305 yards and 12 touchdowns in just 12 games. He's the fourth rookie in NFL history to have 1,300+ receiving yards in a season, and the only rookie to have at least 90+ receptions and 10+ receiving touchdowns in a season. Beckham was named a first-alternate for the 2015 Pro Bowl. On January 7, 2015, Beckham replaced Calvin Johnson in Pro Bowl due to injury. He's the first Giants rookie wide receiver in franchise history & the first Giants rookie since Jeremy Shockey in 2002 to make the Pro Bowl. He was also awarded the 2014 Pro Football Writers NFL Offensive Rookie of the Year Award. On January 31, 2015, Beckham was named Offensive Rookie of the Year by the Associated Press. On May 13, 2015, Beckham was voted to the cover of Madden NFL 16, beating out Rob Gronkowski of the New England Patriots. Beckham is the youngest player ever to grace the cover of Madden. During the Week 15 game against the Carolina Panthers, Beckham was involved in multiple confrontations with cornerback Josh Norman. During the matchup, Beckham was flagged for four penalties, including three personal foul penalties. Beckham was held to no receptions in the first half, but he finished the game with 6 receptions for 76 receiving yards, which included a game-tying touchdown as the Giants lost to the Panthers 38-35. On December 21, 2015, the NFL Disciplinary Committee suspended Beckham one game without pay for multiple violations of safety-related playing rules. He appealed the decision, but the suspension was upheld. In 15 games, Beckham finished the season with 1,450 receiving yards and 13 touchdowns. He was a Pro Bowl selection for a second year in a row. On September 17, Beckham was fined $12,154 for a dance-celebration during Week 1 against the Cowboys. On September 25, he was fined $36,000 for a blindside hit on Kenny Vaccaro in Week 2 against the Saints. During Week 3 against the Redskins, facing Josh Norman, Beckham became became the fastest player to reach 200 receptions by doing so in only 30 games. He finished the game with 121 receiving yards as the Giants lost a close game 27–29. In Week 6, Beckham caught eight passes for a career-high 222 yards with two touchdowns against the Baltimore Ravens, leading the Giants to a 27–23 victory. Beckham has a younger brother, Kordell, and a younger sister, Jasmine. Beckham's father, Odell Beckham, was a minor character in Buzz Bissinger's Friday Night Lights: A Town, a Team, and a Dream and played running back at LSU from 1989 to 1992. His mother, Heather Van Norman, also attended LSU as a track runner. She is currently the coach of the Nicholls State University track and field team. After the NFL combine, Beckham planned on challenging Van Norman to a race in the 40-yard dash. On January 29, 2015, during a live ESPN broadcast from Arizona, home of Super Bowl XLIX, Beckham, partnering with New Orleans Saints quarterback Drew Brees, attempted to establish a new world record for the most one-handed catches made in a minute. He shattered the previous record of 10 as he caught 33 passes. However, this achievement was short lived as CFL player Andy Fantuz recorded 50 one-handed catches in a minute to set the new world record. ↑ ESPN. "Odell Beckham Jr.". ↑ "Newman's Odell Beckham had 22 offers; deciding between LSU and Miami". ↑ "Odell Beckham Jr. Bio". LSUsports.net. Archived from the original on November 1, 2013. ↑ "Newman Invitational". Louisiana Milesplit. ↑ "Isidore Newman School ~ Greenies Go for the Gold: Spring Sports Wrap". ↑ "Five Tigers on Coaches' Freshman All-SEC Team". LSUsports.net. ↑ "Community news from Biloxi and Gulfport, MS - Sun Herald". ↑ "Don't blink with LSU Tigers Odell Beckham, Jarvis Landry big play game - ESPN". ESPN.com. ↑ "LSU WR Odell Beckham Jr. wins Paul Hornung Award for versatility". NOLA.com. 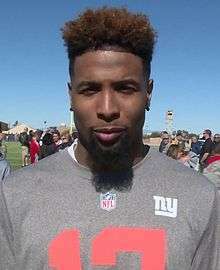 ↑ "LSU Tigers' Odell Beckham, Jarvis Landry will enter NFL draft - ESPN". ESPN.com. ↑ "LSU - Shreveporttimes - shreveporttimes.com". Shreveporttimes. ↑ "Odell Beckham Jr.". ESPN.com. Retrieved 2016-09-05. ↑ Nolan Nawrocki. "NFL Events: Combine Player Profiles - Odell Beckham Jr.". Nfl.com. Retrieved February 27, 2014. ↑ "New York Giants draft Odell Beckham with No. 12 pick". NFL.com. ↑ "Odell Beckham signed by New York Giants". NFL.com. ↑ "Odell Beckham Jr. doesn't disappoint in his Giants debut - Politi". NJ.com. ↑ Fox Sports. "Odell Beckham's one-handed grab might be the best catch of the year". FOX Sports. ↑ "Giants' Odell Beckham makes catch of the year". NFL.com. ↑ "Giants' Odell Beckham Jr. Made The 'Catch Of The Year' That Is Actually The Catch Of The Year". The Huffington Post. ↑ "Odell Beckham lauded for 'greatest NFL catch ever'". The Sydney Morning Herald. ↑ "Odell Beckham Jr.'s Amazing Catch - The Greatest Football Catch Ever - Esquire". Esquire. ↑ "Odell Beckham's jersey from 'The Catch' on display at HOF". NY Daily News. ↑ "Odell Beckham Jr. named Offensive Rookie of the Month". ↑ ABC News. "Sports News". ABC News. ↑ "Player Touchdown Finder Query Results". Pro-Football-Reference.com. ↑ "Player Game Finder Query Results". Pro-Football-Reference.com. ↑ "Player Season Finder Query Results". Pro-Football-Reference.com. ↑ "Giants star rookie Odell Beckham Jr. named Pro Bowl alternate". New York Post. ↑ "Odell Beckham Jr. named to 2015 Pro Bowl". ↑ "Beckham Jr. affected by hamstring". ESPN. Retrieved 26 January 2015. ↑ "Odell Beckham was 'never really healthy' as rookie with two hamstring tears". Yahoo! Sports. Retrieved 26 January 2015. ↑ Graziano, Dan. "Odell Beckham Jr. suspended 1 game". ESPN. Retrieved 22 December 2015. ↑ Graziano, Dan (December 23, 2015). "Giants WR Odell Beckham Jr. loses appeal of one-game suspension". ESPN. Retrieved December 23, 2015. ↑ Boilard, Kevin. "Report: Odell Beckham Jr. fined $36,000 for blindside hit". CBS Sports. Retrieved September 25, 2016. ↑ Keim, John. "Josh Norman, Odell Beckham Jr. behave in rematch". ESPN. Retrieved September 25, 2016. ↑ Bergman, Jeremy. "Odell Beckham: Refs issued me pregame warning". NFL. Retrieved September 25, 2016. ↑ Hanzus, Dan. "Odell Beckham loses to kicking net". NFL. Retrieved September 25, 2016. ↑ Oakes, Jamie. "WATCH: Josh Norman gives Odell Beckham Jr. a ride". 247 sports. Retrieved September 25, 2016. ↑ "Odell Beckham Jr. Stats". Pro-Football-Reference.com. 1 2 "Player Game Finder Query Results". Pro-Football-Reference.com. ↑ "Odell Beckham Jr.'s Top-13 NFL records". yesnetwork.com. Retrieved September 26, 2015. ↑ "Player Streaks". pro-football-reference.com. Retrieved September 26, 2015. ↑ "New York Giants' Odell Beckham Jr. ends rookie year in record fashion - ESPN New York". ESPN.com. ↑ "Player Streak Finder". Pro-Football-Reference.com. ↑ "Family of NY Giants' Odell Beckham Jr. used to seeing great catches". NY Daily News. November 24, 2014. Retrieved May 15, 2016. ↑ "Odell Beckham Jr.'s family marvels at his amazing touchdown catch against the Cowboys". NJ.com. November 24, 2014. Retrieved May 15, 2016. ↑ "For LSU's Odell Beckham Jr., success runs in the family". NOLA.com. ↑ "Odell Beckham Jr. challenging his mom to 40-yard dash". SBNation.com. Vox Media. Wikimedia Commons has media related to Odell Beckham Jr..